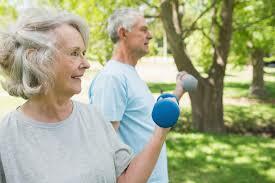 What Are the Best Exercises for Older Adults? Study after study has shown that exercise can help improve cardiovascular health, stamina and bone density while reducing the risk of chronic diseases like diabetes and obesity. These findings hold especially true for older adults who, by the very nature of aging, are likely to lose muscle mass, strength, bone density, agility, endurance and balance as they age. It’s a fight against gravity and time, but staying fit over the long term is a goal worth pursuing. Older adults who exercise regularly enjoy more independence and health than those who don’t. So how can older adults incorporate more activity into their lives and what are the best exercises for them? The key is to find enjoyable activities that you can stick with. These can be anything from walking or water aerobics to yoga, dancing, tai chi or simple stretching. Regardless of the specific activity you may choose to pursue, one key thing to focus on, says Douglas Ebner, a physical therapist at The Ohio State University Wexner Medical Center, is functionality.